Are you tired of watching big perch stare at your lure and not bite while sight fishing? If yes, you should think about purchasing a spear. One of the best ways to bring home a perch dinner is to take matters into your own hands and do some force feeding. This tactic worked for our ancestors and still works today. I decided to purchase a spear last year after getting frustrated by the amount of big perch that would not commit to my offering. The perch would stare at my lure until they moved on. Sometimes they would want to bite, but a smaller perch would take my jig before they could attack. I now get the picky perch in my bucket the good ole fashioned way... by sending them down a steel offering. An old-timer that I know taught me this trick and it seems to work sometimes if the water is clear. Take a plastic peanut jar and drill some holes in it. Turn it upside down and attach some high pound test line to the bottom. When you are fishing, put some minnows in the jar and lower them down to the bottom. The minnows will frantically swim around trying to get out calling in perch to you in the process. I like to set up along weed edges or drop-offs where I know fish will be cruising by looking for an easy meal. If you find structure that is holding fish, they are most likely holding on it for a reason and other fish will be drawn to it as they pass by. When you spear, you want to be in areas that will draw fish in because it is more work to set up to spear and you will waste your time moving constantly searching for fish. Some guys bring a chainsaw with them on the ice to cut out nice size squares to spear fish out of. This is the best method if you don't mind the extra equipment but I prefer to spud my holes out. I drill 4 holes together in a square as close as possible with my auger. I then take my spud and knock out the ice between the holes. This takes a little more work than bringing a chainsaw but I like to pack light so it is the best option for me. Make sure to tie a rope around your spud when you knock out the ice because it may slip out of your hand into the hole as you are pounding away. I like to set up on 4 feet of water when I am spearing so I don't have to throw the spear as far. When you are ready to force feed, slowly lower the spear into the water so the tines are emerged slightly and let the spear go with a little force. I like to aim at the head of the perch. If the fish gets spooked and tries to swim off, you have its whole body length to connect. When you are successful with the throw, push the spear and fish all the way to the bottom of the lake and hold for a few seconds. 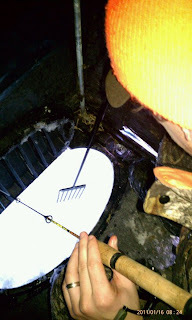 I like to do this to make sure the perch is secure on the spear so I can raise the fish up into the bucket. Once you master the art of spearing, you will be surprised how effective this method is.